First-Gen Celica Still Going Strong In Nicaragua! This is Down On The Street Bonus Edition, where we check out interesting street-parked cars located in places other than the Island That Rust Forgot. 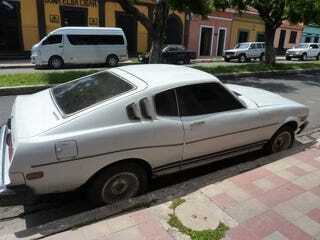 How about an early Celica in Granada, Nicaragua? These cars are rare even in their native Japan, so it was an exciting moment for loyal Jalopnik reader Nick to spot one in Central America. Hey, check out that Dave Zinn Toyota emblem on the trunk lid; looks like this car made the drive from Florida to about 1,000 miles to the southwest. Here's what Nick has to say about his find. So I live in Argentina (originally from Vermont) and had the chance to go to Nicaragua with my dad recently. I spent a couple days attending a fair trade conference and then had some time on my own to travel. I was in Granada when I spied this beautiful toyota than I just had to take some photos of. Unfortunately the windows were completely tinted so I had no shot at seeing inside but I tried my best to capture the car. I am an avid jalopnik reader without actually knowing much about the history and inner-workings of cars and I've always enjoyed the DOTS section. There is something about older cars that excites me. With this car, I especially liked the "liftback" badge which I had never seen. The whole GT thing also helps. I've got quite a backlog of DOTSBE vehicles built up, so I'll try to do at least a few every weekend from now on. Thanks for sending 'em in, and for your patience if you've been waiting a year... or two.